Financial independence is a rapidly approaching prospect for many high schoolers, which brings with it an onslaught of new tasks and responsibilities. Many of these are not self-explanatory and must be taught by someone who has experience, such as balancing a budget. A majority of public school systems nationwide have chosen not to offer life skills classes to their students, which would incorporate financial literacy units and lessons. 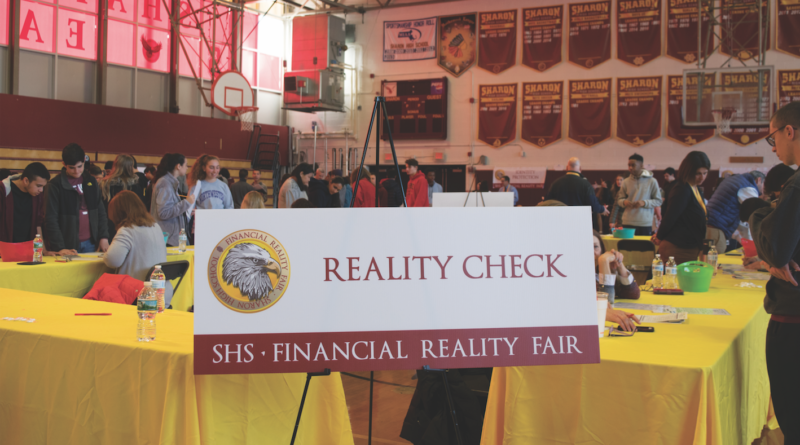 To bypass this disservice to students, Sharon High School has chosen to partake in a Financial Reality Fair. On Wednesday, November 14th, the Junior class participated in the educational seminar. This program is designed to give the students a realistic glimpse of what they can expect in the future when they become financially independent. Co-chair of the event, Lori Glassman says, “The main goal is so that the kids get to see what expenses there are in life. And it’s really living on your own when you’re 25. To start out, to have a job, and see if you can cover all of your expenses and still live within your means.” She continues to say that it is all about being able to design a functional budget from a month’s income. He adds that the event would not be possible without the PTSO sponsorship, the leadership from Greta Nathan and Lori Glassman, and the support from both parents and community volunteers for the planning and execution of the complex activity. There was, as always, a mix of students who were able to navigate the exercise and come out on top and some who weren’t as successful. “It gets you thinking about, you know, what’s going to happen when you graduate college or go into the workforce. So it’s a great program,” Higgins added. He says that it is also important that Sharon has decided to offer this for the Junior class instead of the Senior class as Juniors tend to take it more seriously than Seniors who may be less eager to put forth the energy to complete the activity.